Summary: When Shalini’s father gets a new job in L.A., she is torn away from her life in India and the boy to whom she’s been betrothed since she was three. L.A. is so different, and Shalini dresses and talks all wrong. She isn’t sure she’ll survive high school in America without her fiancé, Vikram, and now she has to cope with her mom’s homesickness and depression. A new friend, chill and confident Renuka, helps Shalini find her way and get up the courage to join the Food4Life club at school. But she gets more than just a friend when she meets Toby—she gets a major crush. Shalini thinks she loves Vikram, but he never made her feel like this. In Lovetorn, Shalini discovers that your heart ultimately makes its own choices, even when it seems as if your destiny has already been chosen. Author Kavita Daswani has always been fascinated by child marriages and betrothals, and this story of a traditional girl from India, who is exposed to so many more freedoms and experiences after being dropped in a completely alien culture, is a fresh and contemporary look at the subject. My Thoughts: When I first heard about Lovetorn, I honestly didn't know if it would interest me or not. It didn't sound like anything I had read before but it was also about a culture I didn't know much about. But hey it's published by HarperTeen and you can't go wrong with that, right? Did I hear you agree? Yes? We are introduced to Shalini who has just moved to the United States from India with her father, mother, and little sister. Shalini isn't used to living with only three people. Back at home, she lived with almost 40 people. There was always someone around doing dishes, chatting, or just in the background making noise. This is so different from what she is used too. Shalini starts a new school and right away realizes she doesn't fit in. The way she talks, the way she dresses, the way she acts isn't like these American girls. She feels like an outcast. Not only that but her sister is adapting really well and that tugs at Shalini a little bit. She wants to fit in. She wants to feel like she belongs. Shalini also misses her fiance Vikram. She's been engaged to him since she was 3. How is she going to spend 2 years away from him? This seems impossible. In time, Shalini makes a new friend Renuka who helps her realize there is more to life than what other people think of you. Shalini starts to be her own person and stops caring what others thinks. She gets involved in a charity project and really helps out. She feels useful. She starts to feel good about herself again. She only wishes her home life was that great. Her mother is taking a fall. She's depressed. She misses India, she's not herself. She gets put on medication, sees a therapist, nothing helps. Shalini doesn't know what to do and tries to cope with things day to day. She also meets a boy. He's a talented flute player and helps with the charity event. She starts to develop feelings for him and starts to question her relationship with Vikram. Need I say more? Read the book now. Overall: Honestly, I was a little hesitate going into this book not knowing if I would like it or understand it. Yes, there is a lot of Indian lingo, but I understood it perfectly. It all flowed just right. I really liked reading about Shalini's traditions and I liked reading more of her story. I wasn't sure which boy I wanted her to end up with but this was a realistic novel. No vampires, fairies, or werewolves. Just plain old simple boys. They weren't perfect, they weren't fighting over her, they were real. 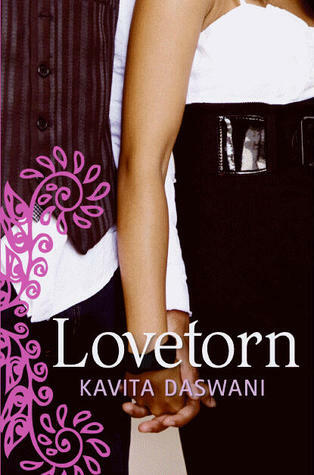 I really enjoyed reading Lovetorn. Family was the most important focus in this book, with some relationships thrown into the mix. Culture also came into play. Lovetorn was just what I was in the mood for and if you like these type of books, you won't be disappointed. Cover: Really like it. It fits. They also don't have completely white skin so its realistic. We also can't see their faces which I like so I can imagine them to look the way I want. This sounds like a really refreshing read. I love reading new lingo. Gives me something new to learn!